You are entering the scrap blog documenting the journey of Jules and Li. Our plan is to ride 2 lovingly handmade bikes which we crafted in bamboo. Yes………bamboo, for the many that ask twice! We will ride from London United Kingdom to Sydney Australia. The route is somewhat flexible and dependant upon what the world throws at us and will be in response to the challenges and experiences gained over the next 12-18 months. 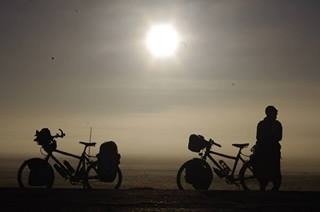 There will be posts about our bikes of course, tears and triumphs…….and definitely stories and experiments with food as we learn to bring our passions to the wild camp kitchen. This is a virtual phone call home to let loved ones know when we are safe. For others that are interested we hope to feed back what we learn. This is no longer a lonely planet and in our own way we hope to give at least a little of what we can gain as we jump in and chase our dreams. We have learnt much from others on line, when we were planning for this trip. It is quite a challenge cycling most days as well as trying to construct a blog and 9 months into the journey we have not posted as much as we would like regarding the initial bike build, kit we are carrying etcetera. If you have any questions regarding any aspect of our journey, or parts of the route you would like us to write about, please ask. Suggestions and must visit places…..also words of encouragement are not only welcome but helpful in giving that extra boost when a tail wind fails us. ….seven, eight, nine, ten, eleven…..seventy two, seventy three….it’s an incline and its like a furnace, my mind wanders I don’t remember beginning to count, seven, eight,nine, ten, eleven…..eighty eight…..counting the repetition of the pedals. I never finish counting and seams I never remember starting, my mind can go in circles like the pedals…..then I’m chasing a butterfly, racing it, it flies alongside for a while, I am not longer counting, distracted by the beauty and absurdity of racing a butterfly. I am a bit delirious so Li cycles behind, it should not be far before we locate a camp site, exhausted and so very hot but not overly noticing the discomfort. Better not to think about. There is comfort all around. I start a song, we start a song, don’t know the words, too exhausted to make one up…..Fresh, start a song…..don’t know the words, new words to get over the next hill. Giggle at nothing in particular. Giggle a lot, at reaching a crest, laughter at the animation during brief encounters with creatures I do not recognise, and they do not recognise me. You are staring, staring, laughter at self, then long periods of blankness and then more laughter. Sadness, missing You…….Look at the computer, 6 kilometres an hour….. Eighty eight, eighty nine……seven, eight……the computer, 23 kilometres an hour, are we going down hill, or flat? You say, flat……startled that I have found some energy again. Maybe it was the effect of picking up the tortoise I rescued from the middle of the road. I am excited and want to keep it. I think about the tortoise and ones I encountered in my youth. The road kill can make me cry…or the effect on my senses….recoil in revulsion….and just the fragility of life. I reflect on my bike mishap, not wanting another… concentrating on the road, the potholes, sand, gravel, the well travelled tracks, cars, trucks, horse drawn carts. But it was a an impressive somersault, You said I landed on my head, too fast, track just a fraction wider than the tyres and grooved. I watched the river, slow amazement that my feet unclipped from the pedals, that I rolled, up again smiling and unhurt. But thinking I don’t want another. I cry a lot…..I cry at the full moon, it is…. beyond description. I cry when I meet you, I leave you. I cry because I am receiving far more than I can give. Country number nine,…….ten, eleven…..is this real…I am a fake, this is a dream, this is my dream, our dream….seven, eight, nine…..this is not so difficult….it should be. Maybe tomorrow it will be too much. I will go home….I do not know where home is. I miss You. I love You, I do not want to go home, this is my home. This small world is our home. This world is too big….I can not think about it. One day at a time…..nine, ten, eleven, no idea where our legs will take us, take me, where my mind will take me. Do I remember correctly. It does not matter, I am so very happy. Nothing hurts so much and I will crest the next hill, even mountain, even if I have to push, and I am lucky….. In the saddle I speak to myself, was it out load, everything is loud with only bird song and the whirr of the bike. Breath, heart pumping…it is all so loud. I have questions, more questions by the day, more curiosity, no language, just signs, laughter and smiles. I can say no more, there is nothing profound to think about…..just emotion. no matter where you are and what you are doing – home is where the heart is… and I am in your hearts, and the hearts of all my friends. Your courage and determination is admiral! Just want to wish you both a very merry Christmas and hope you have a lovely day! When are you expecting to reach Sydney? Go well and take care. This is freaking amazing, fingers crossed for you! Have been watching your trip and so impressed that you have made it so far already! Saw Lucy, Liz, Chloe and Lucinda the other night for dinner (while Lou was back on a short trip over from Aus) – we spent a while discussing your travels and all agreed you are very brave and we all envy your ambitions. Stay well. Sorry to hear abt the recent bad experience but it seems you are still triumphant on myour adventure. Mary, what a wonderful surprise to hear from you. Think you a pretty tough woman yourself! If we have the pleasure of seeing you again, next time may it be the tree house? Thanks for kind words. Wishing everyone in Budapest all the best at this time. Good Luck… please let me have your twitter details and I can tweet madly on your behalf. Denise. There is nothing two women of your courage and intelligence can’t achieve. You are going to have such a wonderful adventure. Bon Voyage my darling little pandas. The people in our lives have lead us to this point………with this reply maybe i shouldn’t post a chaotic picture depicting the situation 6 days before departure!